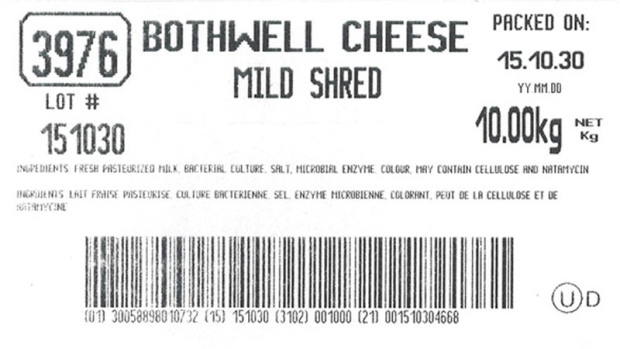 A Canadian cheese maker is recalling some types of shredded cheese due to a risk of Listeria monocytogenes contamination. , is recalling its white and old shredded cheddar. The recall also extends to its mild and old shredded cheese, and mozzarella blend. All products contain the lot number 151030, or the UPC 0 58898 34082 1. The affected products were sold in Quebec, Manitoba and Saskatchewan. The Canadian Food Inspection Agency (CFIA) warned that the product should not be consumed, and should be thrown out or returned. Food contaminated with Listeria monocytogenes may not look or smell spoiled, but can lead to vomiting, nausea, fever, muscle aches, headaches and neck stiffness. CFIA said pregnant women, the elderly and those with weakened immune systems are particularly at risk.